Sleep is a critically important function for all animals and birds are no exception. It is the process by which they recharge mentally and physically to prepare for another day’s activities. As with humans, insufficient sleep can lead to physical and behavioral problems. Every animal benefits from getting a good night’s sleep. Birds make up a large and diverse part of the animal kingdom. Their varied habitats, physical features, and lifestyles have an impact on where and how they sleep. They also have some distinctive characteristics that allow them to sleep in a unique fashion. 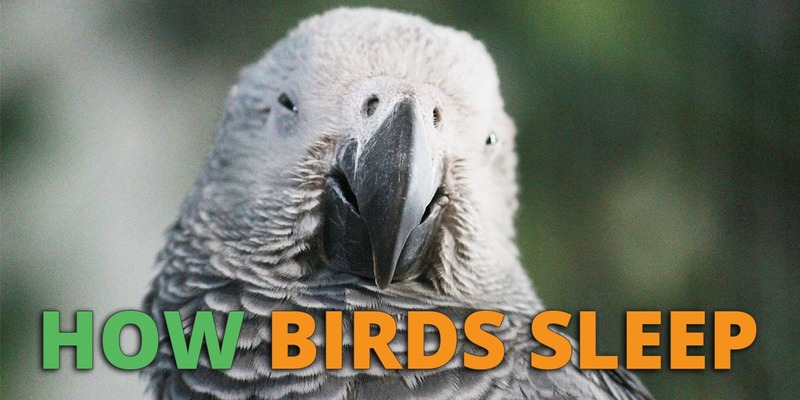 We will take a look at some of the different ways that birds sleep, both in the wild and in captivity. Where Do Wild Birds Sleep? Birds have the incredible capability to sleep with one eye open. According to the science direct website, they share a quality with some aquatic mammals that is known as unihemispheric sleep. 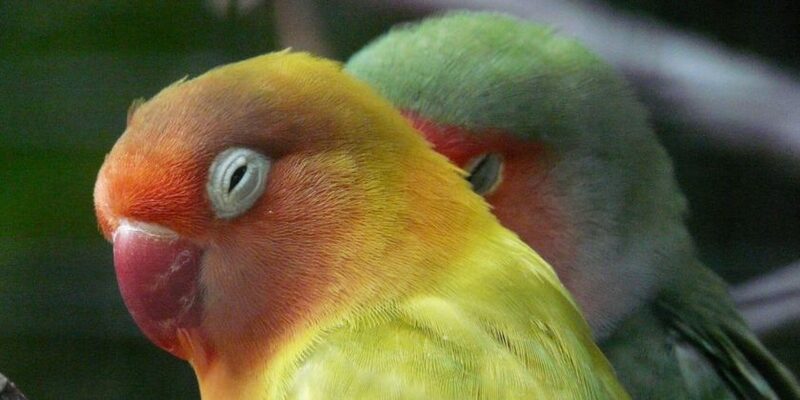 When engaged in this type of sleep, one half of the bird’s brain is awake while the other is asleep. The eye on the active side of the brain remains open and the alternate side eye is closed. Birds also close both eyes and engage in bihemispheric sleep as do most other living creatures. Many species will take many short rest periods of bihemispheric sleep during the course of the day. The most striking advantage of sleeping with one eye open is that it affords the bird an opportunity to detect predators while resting. A study published at nature.com shows that birds can sleep even while flying. Despite having one, and at times, both eyes closed, birds on long-term migrations can maintain their navigational ability while sleeping. Birds in the wild have a variety of sleeping styles and locations. A primary concern of wild bird is the avoidance of predators. During the day they can use their superior eyesight to remain safe, but at night they need to find a place that gives them as much security as possible. In the winter they also need to consider keeping warm and this may influence their choice of sleeping arrangements. The choice of location is often determined by the class of bird in question. For instance, water birds often sleep standing at the water’s edge or on some submerged object, tucking one foot up into their body. This conserves the loss of body heat by covering unfettered body parts. Many other birds also tuck a foot against their body, or their head under a wing for the same, heat-saving purpose. Songbirds such as cardinals and finches favor thickets of dense vegetation to provide their bedtime security. This locale serves as protection from wind and rain as well as making it difficult for predators to reach them. Bobwhites sleep on the ground, in a circle with their heads pointing out. This helps maintain body heat and puts many watchful eyes on guard for predators. Woodpeckers favor tree cavities as sleeping quarters. Wild turkeys, who spend the majority of their time walking on the ground, take to the trees and find secure branches on which to roost. It is a striking sight to see a group of turkeys gliding down from above in the morning light. Perching birds often choose to simply find a secure place to perch when going to sleep. The Cornell Lab of Ornithology explains how they do this without falling. By placing weight on its leg, the bird’s muscles force the tendons in its feet to keep the foot closed. This locks the foot in place and affords a great grip that endures throughout the bird’s rest period. Wild parrots usually sleep in flocks and have a designated roosting area. They arrive at that spot about an hour or so before nightfall and conduct their last social interactions of the day in close proximity to their sleeping roosts. Their sleep cycle is determined by light availability, and in some cases may be disrupted from sleeping by a bright full moon. The best way to determine how much sleep your parrot needs is to consider where the bird’s native environment is located. Most parrots come from equatorial areas that have an average of 11 hours of daylight. A good guideline for your pet is to give it 10-12 hours of uninterrupted, quiet time in darkness. Inadequate sleep can lead to behavioral problems, and even the occasional interruption, such as having a loud party in the house, will lead to a cranky parrot in the morning. A challenge when keeping pet parrots is to provide the proper environment for it to get the required rest while balancing the needs of the bird and you and your family. This often means having some living space designated as your parrot’s sleeping area, away from light and noise from radios or television. If your bird spends most of its day in your home’s general living area, then you will need to have a separate room where it retires for the night. Another alternative is to house your birds in a room that is not used at night. Then you can simply close the door and shut out the light at the end of the day and let the birds get a peaceful night’s rest. You can use a bird cage cover at night to help keep out light, which is particularly helpful in rooms with thin curtains. Many parrots prefer to simply perch and tuck their head under a wing when sleeping, so secure some perches located high in the cage. Pet parrots will benefit from a consistent bedtime routine since by being indoors they are not governed by the rise and fall of the sun. There are various bird nests and huts that make a nice place for smaller parrots such as conures or budgies to sleep. They will feel secure and warm and wake up refreshed and ready to spend another day interacting with their human friends.